Ebola has infected an estimated 7,470 people and claimed the lives of 3,431, mostly in West Africa. These numbers, as well as the death of Thomas Eric Duncan in Dallas, Texas on Wednesday, are a fearsome testament to how rapidly the virus can decimate a community. But it's good to be afraid, Centers for Disease Control and Prevention director Tom Frieden said in the days before Duncan's death. "It's normal to be scared -- in fact, for the health care workers who are caring for people with Ebola, we want them to be scared," Frieden said in a press conference on Sunday (Oct. 5). "We want them to have a healthy respect of the risk for any lapse in infection control procedure. We want them to channel that fear into being incredibly meticulous about infection control." But that fear, or "healthy respect," should be accompanied with reason. Despite the disease's presence in the U.S., chances of the average American contracting the virus are slim to none, as public health officials have assured the public multiple times. 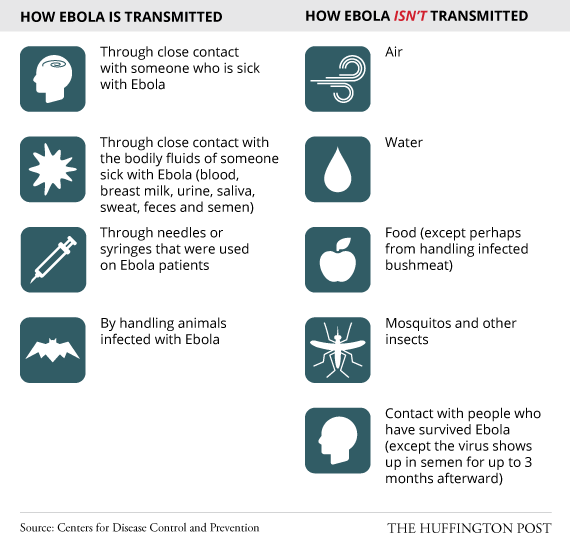 For one, the Ebola virus doesn't do well outside the human body. On dry surfaces, the virus lives for a few hours at the most, but in liquids like blood (which only health care workers and relatives of the sick have to worry about), it can live for days, according to the CDC. Generally, person-to-person contact -- not object-to-person contact -- is what spreads the virus. Story continues below the graphic. Still, there's a lot of anxiety out there about how infected people can spread Ebola, particularly people who may not realize they're incubating the disease. While Frieden admitted that it is theoretically possible to be infected with Ebola after touching something an infected person has sneezed or sweated on (and then touching your eyes, mouth or nose), he bluntly said that public transportation via a bus or plane is not a conduit for Ebola. "I'm just saying that this is not like flu, it's not like measles, it's not like the common cold," said Frieden during a press conference. "It's not as spreadable; it's not as infectious as those conditions."